Antonio | Has it leaked? 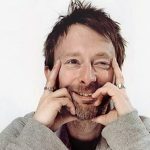 Radiohead is a great example of a limitless-evolving band. I´m sure the ninth album will be a masterpiece no matter which songs they include or not. Personally…” Ful Stop” and “Cut a Hole already sound like a “must studio it”. It´s Leaked on piratebay and seeders are growing! Seed and enjoy!